Basically since the moment Jon and I started dating, we have kept a never ending comparison list of things in the United States vs. their counterparts in the United Kingdom. Obviously, I’m almost always on the side of all things American, and Jon is vice versa. Our discussion of theme parks while still in Korea led to me raving repeatedly about Cedar Point and all its amazing, roller coaster-filled wonder (sidenote: there was a 7/8 year streak back in school where I went at least once or more a year due to school trips for honor roll/senior trips/band performances/etc). 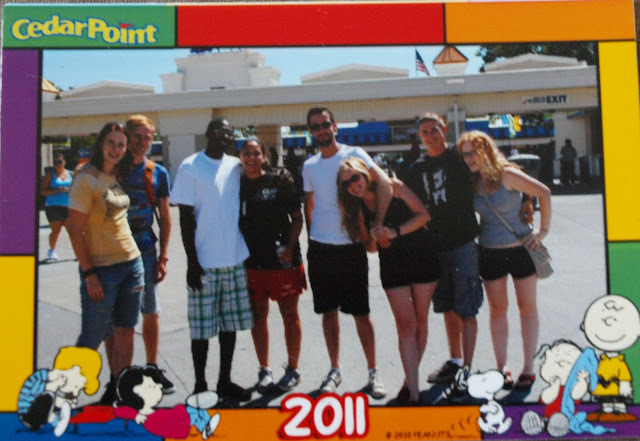 Finally, this week we made the 2 hour trip up to Lake Erie so Jon could experience all that is Cedar Point. My dear friends Rachel and Ryan are in town for the wedding on Friday, and I honestly couldn’t have had a better time. I was giddy with excitement the whole day. We forgot to bring in our cameras, so at the end of our day, as we shuffled towards the exit to the parking lot, I shelled out the extortionate $12 bucks for 4 wallet-sized photos in order to take home the picture that had been taken of us as we entered the park in the morning. I will cherish this silly keepsake forever because it was a day of childish fun with my best friends and my soon-to-be husband. It is a moment before so many moments, when we were young.